Naples is a particular city, not always seen positively and even more often mistreated or “ignored” as a travel destination. In reality, however, it is a city that deserves more than an opportunity: the capital of Naples has so much to offer, in terms of places to discover and stories to listen to! Every time I return I find out new things, magical places that leave me speechless, and also on my last trip last February I found out some new areas. With this post, then, I want to tell you 5 places to discover when you go to Naples. 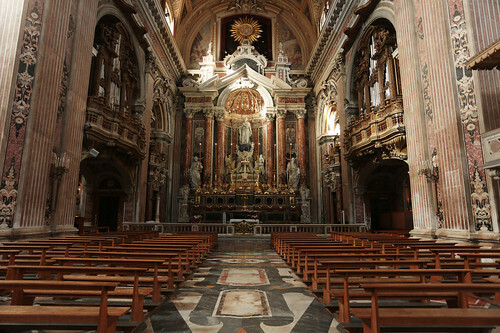 Also known as Santa Maria di Monteoliveto, it is one of the many great churches in Naples. The work done by Benedetto da Maiano, Antonio Rossellino and Giorgio Vasari has made it one of the most important monuments of the city concerning the works “in Tuscan Renaissance style”. 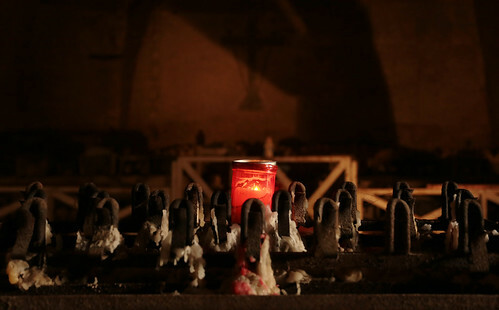 The church was founded in 1411 and was entrusted to the Olivetan fathers. It was enlarged under Alfonso II of Aragon, king of Naples and later became one of the favourites of the Aragonese court. 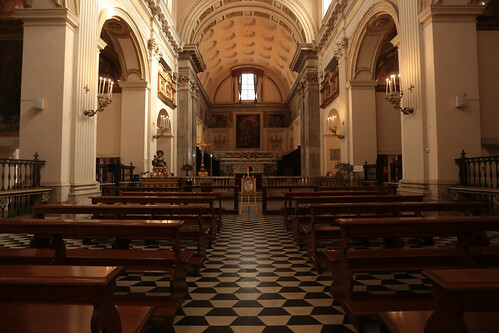 In the seventeenth century it was transformed again, and in 1798 Ferdinando I of the Two Sicilies ordered the removal of the Olivetans: the Archconfraternity of the Lombards, whose church had become unusable after the collapse of the ceiling, then moved to this church (which changed name in 1801, becoming Sant’Anna dei Lombardi). Part of the façade was rebuilt after the Second World War due to severe damage suffered during the Allied bombing. On the right of the building, there is the monastery of Santa Maria di Monteoliveto, which was suppressed in 1799 and adapted for other purposes (in 1848 there was the Neapolitan Parliament). Three of the 4 ancient cloisters today are part of the Carabinieri barracks “Pastrengo”, whose main façade is adjacent to the church, while the fourth (the central and most significant) has been incorporated into private homes, although it is still possible to see the entrance and inside. This church struck me immediately, as soon as I stepped into the small square it overlooks. Why? For its small dimensions and its relatively “anonymous” stone facade, which perfectly reflects the very simple interiors: a single nave, without a transept and a dome and a barreled roof covered by a coffered ceiling. Few frescoes, almost none, on the wall. vecchio”). In 1767 the church became a property of the reformed Franciscans after the Jesuits were banished from the kingdom of Naples (they were “readmitted definitively” only in 1900). The church was severely damaged by some air attacks during the Second World War: in fact, today, a bomb dropped on the roof of the central nave and remained unexploded is exposed in some rooms adjacent to the right aisle. Inside is the body of St. Joseph Moscati, canonised by Pope John Paul II in 1987. This church has impressed me both for the peculiarity of its facade and for the glitz of the interiors: impressive, massive, frescoed and decorated in every corner of its aisles. beautiful. 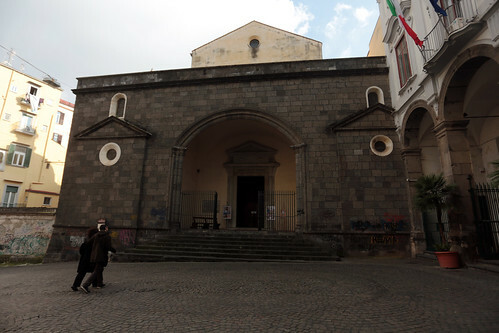 Also identified as the monastery of Santa Chiara, this is also a monumental building of worship in the city and is one of the most important and large monastic complexes in Naples. This basilica is the largest in Gothic style and includes four great cloisters, archaeological excavations that have brought to light remains of Roman baths and the Opera Museum. Commissioned by Roberto d’Angiò and his wife Sancia di Maiorca, the works began in 1310 and was completed in 1328 and was finally opened to the public in 1340. 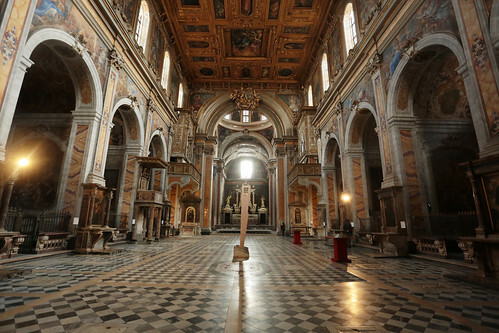 The interiors were worked by significant artists of the period such as Tino di Camaino and Giotto. 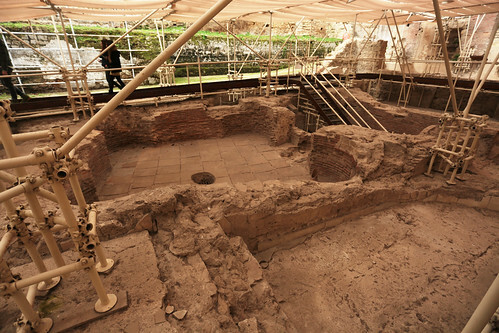 The enclosure complex for the minor friars then became the church of the Clarisse. The building suffered extensive damage during the Second World War: on August 4, 1943, there was a bombardment by the allies, and from this, a fire broke out, which destroyed part of the interior and most of the frescoes (those of the eighteenth century went utterly lost). Subsequent restoration work focused on the intact medieval architecture and was completed in 1953. 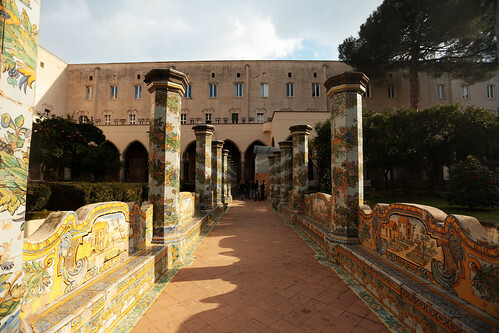 The majolica cloister (or convent of the Clarisse), one of the four magnificent cloisters of the monastery, is one of the most famous artistic-architectural works of all Naples. 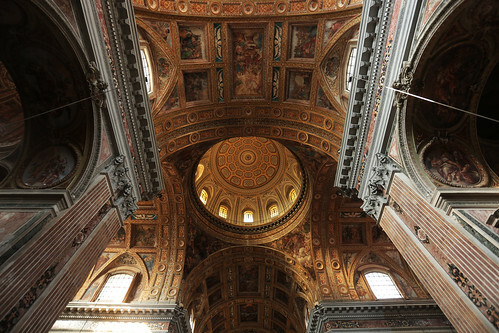 It was built in 1739 on the work of Domenico Antonio Vaccaro. The bombing of 1943 did not damage this cloister, but unfortunately, many of the documents in which they spoke were destroyed, and there is no information about the fourteenth-century and seventeenth-century frescoes that can be admired along the walls of the porch. The entrance ticket for the cloister costs 6 euros per person, and I think it is an expense to do: travelling a lot I often see beautiful places, which made me immediately think “wow!”, But never as it happened visiting this cloister. Looking from the outside of the church, I must admit, I thought it was a normal monumental complex like many others, with a church with an anonymous façade in its being similar to many others. And instead, I was blatantly wrong! Composed of a church, a former convent and a museum, the monumental complex of Santa Maria la Nova is one of the most beautiful artistic-religious compounds of the city. The construction work began in 1279 when Charles I of Anjou donated land just outside the walls to the order of the Friars Minor. The church, rebuilt almost entirely between 1596 and 1599, has a single nave with seven chapels on each side and its ceiling in gilded wood is very particular. 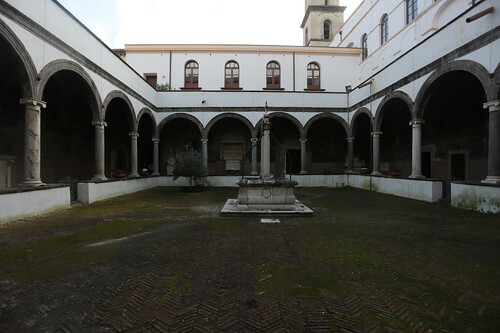 The convent includes the sacristy, the refectory and two cloisters (of the upper convent, which today houses offices in the province, the frescoes have been lost). The upper floors of the convent, which remained in operation until the end of the nineteenth century, once housed the monks’ cells, while today there is a museum of contemporary religious art inaugurated in 2006. The contrast I mentioned at the beginning, between the simplicity of the exterior and the splendour of the beautiful interior, is one thing that makes this complex even more special and worthy of a visit. Open from Monday to Friday from 09:30 am to 3 pm and Saturday and Sunday from 09:30 am to 2 pm, the entrance ticket costs 5 euros per person. This is the most particular and mysterious place among those I have spoken to you in Naples, not only in this post (but just since I started telling you the city here on the blog). It may be for its history, perhaps also for its location, but now this cemetery is one of the first things I will suggest to see in Naples. “pezzentella”). 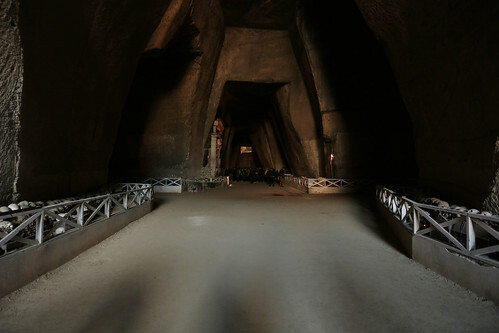 The cemetery is located “at the end” of the Sanità district: it is a district located just outside the ancient Greek-Roman city, where the pagan necropolis first and then the Christian cemeteries rose. In this area, there were numerous tuff quarries (used until 1600 to find this material, depending on the construction of the city itself. 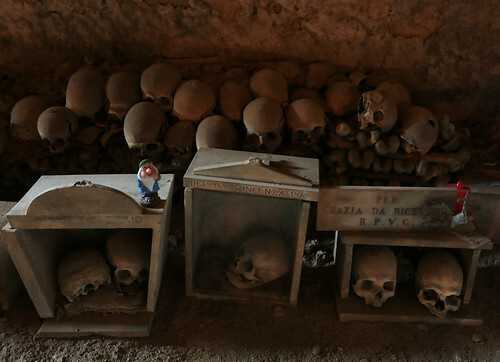 In the time, the bones of which I spoke at the beginning were added those coming from the “terresante” (burials) hypogea of churches, reclaimed after the arrival of the French) and other excavations. Today it is said that under the current floor there are compressed bones at least four meters deep and buried there by specialised gravediggers: this happened, centuries ago, because the “regular” cemeteries finished the space and the gravediggers moved the bodies (even if the burial was regularly paid) during the night. In March 1872 the cemetery was opened to the public for the first time, on 29 July 1969 a decree of the ecclesiastical court for the cause of the saints forbade the private worship of the capuzzelle (because it was the object of a faith considered pagan). The progressive devotional oblivion slipped the cemetery into obscurity and fell into a state of neglect until 2002 (although it is possible to visit it only a few days a month). The municipal administration reopened the Cemetery to the public, systematically and regularly, in 2010.